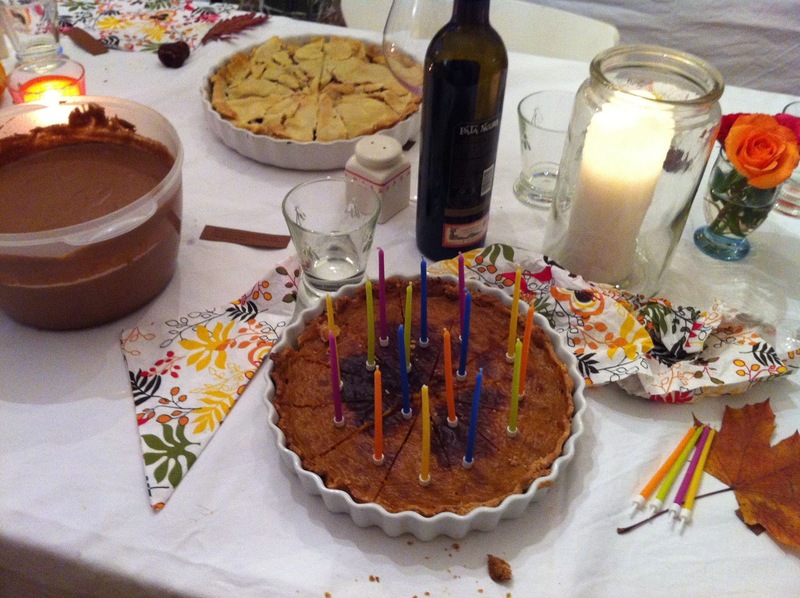 Walk Along the Way: Our Super Deluxe Trans-Border Thanksgiving Birthday Extravaganza! Our Super Deluxe Trans-Border Thanksgiving Birthday Extravaganza! Our first Thanksgiving here we had two roast chickens because I couldn't find a turkey in the market and didn't have the guts to ask about one. Fortunately our good friends The Caramel Family were visiting and they shared their love and their sweet potato recipe which made up for the lack of turkey. Last year, I got brave and asked about a turkey at the market butcher counter and after calling around awhile, the man told me that I was too early. Whole turkeys could only be had for Christmas, and if one wanted one at any other time one must order very far in advance. With three days to go and no turkey, I shared my woes at our home group and Jean-Noel said, "No problem, I'll take care of it." I was relieved, but it sounded...well, a little mafioso. Jean-Noel manages a company in the Alsace that makes charcuterie: sausage and ham and paté and all kinds of the delicious kinds of things for which Americans get all excited about when they come to Europe. Sometimes at home group he regales us with stories of ordering thousands of kilometers of sausage casing and the like. To my knowledge, he doesn't deal a lot in turkeys, but from his tone and the look in his eye I imagined him calling up his "turkey man" to "take care of things." He was true to his word, and with one day to spare we got our turkey. It was petite and delicious and we ate our Thanksgiving meal as a family and then it was done. Then Jean-Noel told me, "So next year, just let me know a little earlier and I'll get you whatever you want." This year what I wanted was a bigger turkey. The whole conversation had piqued the curiosity of the other members of the home group. What is Thanksgiving, exactly? How do you celebrate it? If you are still here next year, we will celebrate it with you. November 1st of this year I said to Jean-Noel, "Okay, Thanksgiving's at the end of the month. We're still here, so I need a turkey." And there I had no idea. I still don't really think in kilos, especially when thinking about turkeys. "Uh, I dunno, kind of about this big," I said, gesturing about with my arms. A couple weeks later, I reminded him about my turkey. 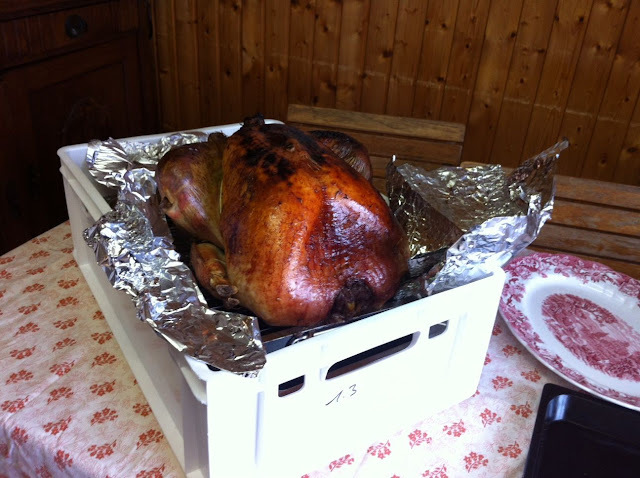 The word came back: either a 3.5 kg turkey (7.7 pounds) or a 7 kg turkey (15.4 pounds). If I wanted two smaller ones I should order right away but the turkey man said that the 7 kg ones could be had whenever. By this time, we were going to be a total of 19 people, since Artemis had graciously consented to combine her birthday celebration with our Thanksgiving Feast. Okay, I'll go with the 7 kg anytime one. Still, Jean-Noel's wife Alia said, "A 7 kilo turkey!! That's enormous! I can't imagine it!!" Closing in on Thanksgiving Day. I'd asked for turkey delivery on Thursday, since we were celebrating on Sunday. That gave me enough time to prepare and brine, though I was a little unsure where I'd put it in the meantime. The fridges are petite too. Thursday morning Alia called me, her voice ringing with disbelief. "Jean-Noel called me. They delivered the turkey. But it's 11 kilos!!! He says he can bring you that one today or he can send it back and he'll get you the 7 kilo one tomorrow." I got out the tape measure and measured my petite oven. "Send it back! 11 kilos won't fit in the oven!" 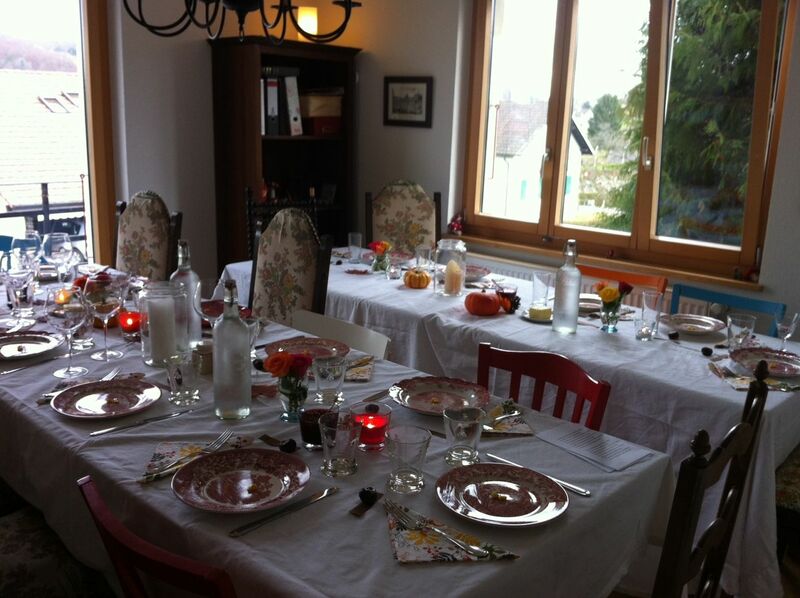 Later in the day, a text message: Bad news is that there is no 7 kg turkey and the 11 kg turkey is at our house. Good news Jean-Noel thinks it might fit in our oven. Thursday night I went to see it. I didn't know what to think. It was beautiful, but absolutely enormous, even by American standards. Alia kept calling it la bête, the beast. "When I opened the trunk of the car, I almost fell over," said Alia. "It was the neighborhood attraction! My friend called her children over to see such a big turkey!" Even Jean-Noel admitted that his work colleagues has laughed incredulously at such an enormous bird. "Those crazy Americans," I imagined them saying, shaking their heads. It would never fit in our dainty Swiss oven. We could cut it up to roast it, but wouldn't that be a shame? I didn't take it home as planned because where would I put it? And anyway, it was over the limit of poultry meat to bring back into Switzerland. I would need another 3 people in the car. Our friends live only 10 minutes away, but they live over the border in France. Every person has the right to bring 3 kilos of poultry meat into Switzerland each day. To bring our turkey in legally we would need at least four warm bodies in the car. So our turkey, christened Thomas, spent the night alone in their extra refrigerator, after being visited by most of the home group, cracking jokes as they came about the Mr. Bean and the Turkey episode. Would it end up on someone's head? Friday I spent most of the day in turkey denial. Towards evening I visited the turkey again and decided to take up Jean-Noel and Alia's offer of roasting it at their house. I went home and made the brine roughly following this recipe. Saturday dawned and I was still in turkey denial. Meanwhile I'd been diligently preparing other stuff: cranberry relish, gravy, sweet potatoes (following Mrs. Caramel's recipe!) and the girls were helping wonderfully with potato peeling and piecrusts. In the afternoon, we had a kids' club meeting at Jean-Noel and Alia's house and while the kids munched on crèpes in the other room, a turkey conference was held in the kitchen. Thomas the Turkey could just squeeze into their oven. But how to brine it? And stuff it? And roast it? And then transport it across the border when it was all done? I imagined the border guards asking if we had anything to declare while turkey aroma wafts out of the car. "Um, no...not really. Just this ginormous cooked turkey that we're taking out for a drive." I wondered aloud about coming over early the next morning to stuff the beast. I didn't want to stuff it the night before -- isn't that how people get salmonella?? Then Jean-Noel offered to get up early to stuff the turkey and put it in the oven. "Okay," I agreed, (somewhat reluctantly...would he do it right?) "It's kind of your fault, anyway," I said, "I didn't want a turkey that big," and he agreed. And then, while sitting there on the floor with Alia taking pictures, I had a lovely feeling. This too, I told my friends, is part of Thanksgiving. All the fuss about the turkey, how will it fit? how will we cook everything else while it's in the oven? Working in community to make it all work out. That right there made it feel like Thanksgiving. "After all," said Alia, "it's a story we can tell our grandchildren! 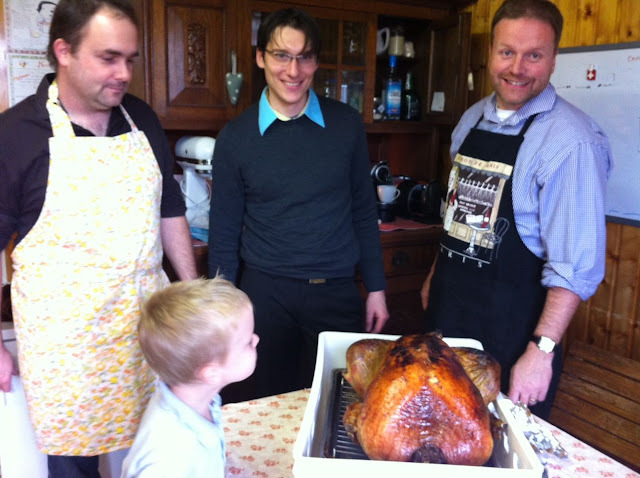 We celebrated Thanksgiving with the Americans and had to transport the turkey over the border!" Brining in the garden bin. Ah, the turkey was being stuffed! It would go in the oven on time! And do you know what I did then? I rolled over and went back to sleep! It was beautiful. Into my dreams came the bing, bing of another message...a photo of the turkey going into the oven. I rolled over and went back to sleep again. The rest went like a dream...I got a few more text messages to prove that he was roasting well and being faithfully basted. I went over to visit once during the morning. And then after the others arrived from church, Turkey made his border crossing with no passport and no problem, wrapped in foil inside a couple industrial food crates. With the tables waiting and the apéro drunk, the men were sent into the kitchen to carve up the beast in time honored fashion. Everyone else crowded in too, to watch and exclaim and to snitch preview bits of juicy turkey from the platter. And that too, felt like Thanksgiving. The beautiful turkey was, as several said, "just like in American films." And it was absolutely delicious. I'm not sure if it was the happy French turkey or the brine or the combination of both or the collaborative effort, but I'm certain it was the tastiest turkey I have ever eaten. The rest of the day evolved in time-honored fashion...lots of eating, game playing, couch napping, a walk for some and a pick-up baseball game for others. Then dessert and "Happy Birthday" and eventually a guitar and Christmas carols. And at the end of the day, as our guests departed joyful, content and stuffed, it felt like Thanksgiving in my soul. If you would like to see more photos of our day, please go here. Just wow. :-) What a fun story. Thanks for sharing. I can't wait to read your book. You are such a great writer.